This item comes courtesy of Rami Metal, the Community Liaison for City Councilman Steve Levin. 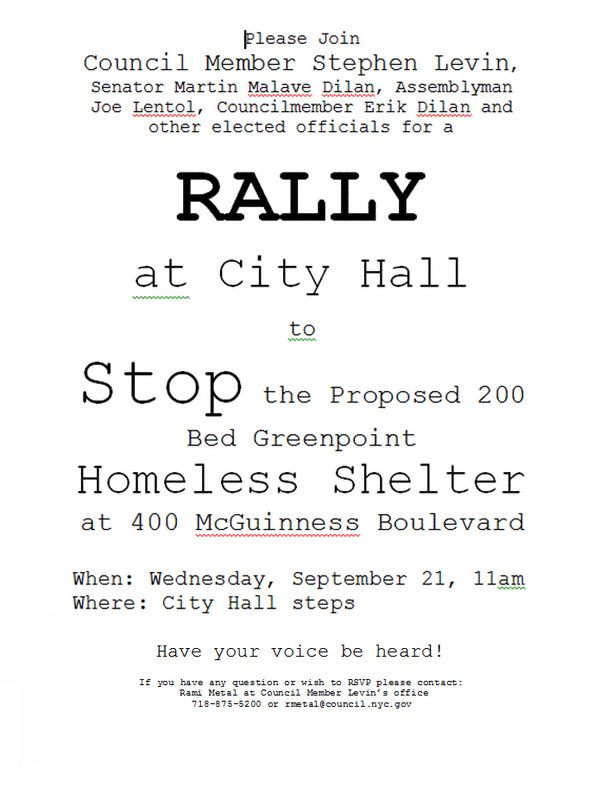 Next Wednesday, September 21st, at 11:00 a.m. Mr. Levin along with Senator Martin Malave Dilan, Assemblyman Joe Lentol and other notables will be present on the steps of City Hall to protest the proposed homeless assessment center for 400 McGuinness Boulevard. As some of you might recall, our City Comptroller (and Mayoral candidate), John Liu, has initiated an investigation into this shelter and others citing “irregularities“. What will happen with remains to be seen. However, in the meantime anyone who has questions or wishes to RSVP should contact Mr. Metal at the above-listed email address or telephone number. September 21, 2011 at 11:00 a.m.